Okay, ladies listen up this stuff right here, this Advanced Night Repair serum by Estee Lauder is the bomb!!! I think this one is my all-time favorite literally. I purchased this night serum from Macy’s over six months ago while doing some Christmas shopping. I know some ladies actually use Estee Lauder makeup line, which by the way has some incredible makeup for all the ladies out there who are wondering. This night serum is POWERFUL! Best nighttime renewal for radiant, youthful- looking skin. IT literally adds instant radiance. For my ladies that wear makeup throughout the day, we all know how annoying it can be when we wipe that makeup off at the end of the day and not knowing what else we should put on so our face can have a glow. We all know that makeup can leave our face feeling dry and also leaving are face dull with little to no color. This Advance Night Repair serum gives your face all the hydration you’re looking for when the makeup comes off at night. Advance Night Repair significantly reduce the look of key signs of aging. To all my ladies out here after trying this serum you might throw away the makeup and start rocking your natural beauty, that is how wonderful this product works. ~ I did a little research on what ingredients are in this product, I think it is very important to know what we are putting into our skins. 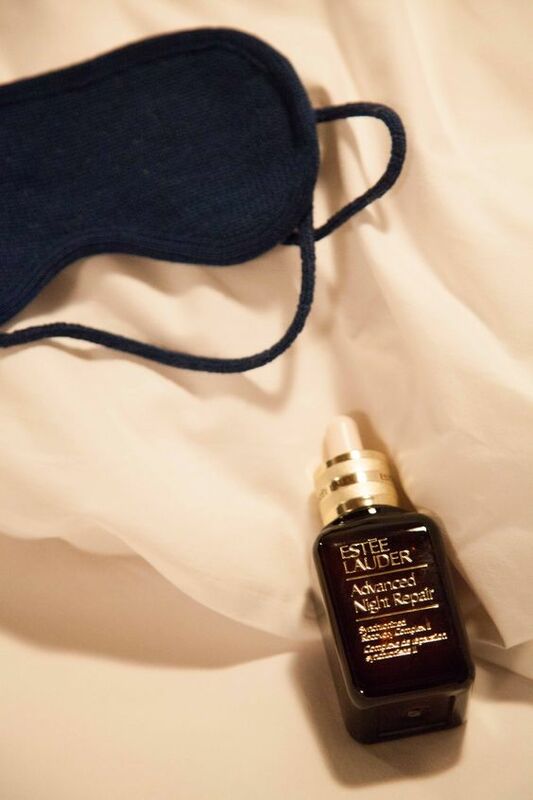 According to Estee Lauder “, this Advanced Night Serum maximizes the power of skin’s natural nighttime renewal with exclusive ChronoluxCB Technology. It also includes Hyaluronic Acid, nature’s moisture magnet, to help lock in moisture. I suffer from wrinkles underneath my eye area, with this advance night serum my lines look significantly reduced. I saw a difference in 4 weeks from using this every night. My skin felt even younger, radiant, and more even toned. Not to mention this serum also works on damaged skin especially for my ladies who have skin damage from tans. It reduces acne marks, undereye puffs which I can tell you I suffer from under eye puffs for many years. I could go on and on about how fresh my face felt. The best way to see results is to use this every night. I love the fact that this product has no scent, being able to find a product with no scent is a plus for me. ~ I cannot go on about the fact that this is a must-have! My friends and family even saw the difference in my skin. I’m literally glowing day and night! This product comes in different sizes, you can even purchase a travel bottle if you’re just wanting to test it out. Thank you all for reading this review! Tell me what you guys think about this product in the comments! tag me on Twitter! I love Estée Lauder makeup line. I have heard such great reviews on this night serum will most definitely try this out.